While not a traditional soufflé, sweet potato soufflé is a light, fluffy sweet potato side dish that can be topped in a variety of fashions. Canned or fresh, topped or unadorned, learn how to make a sweet potato soufflé and introduce your family to this traditional holiday dish. Soufflé sounds a lot more complicated than it actually is. No matter what else you have cooking in your kitchen, you should have no trouble throwing together this simple recipe. Fill a large pot with cold salted water and set the sweet potatoes inside. Bring the water in the pot to a boil, then reduce the heat and simmer for 20 minutes, or until the sweet potatoes are fork tender. Drain the potatoes and mash them in a large bowl. Add the evaporated milk, brown sugar, butter, vanilla, cinnamon, salt and pepper and eggs to the potatoes and mix thoroughly. Press the mixture into a buttered casserole dish and bake at 350 degrees for 25 minutes. Mix together the cashews, marshmallows and coconut in a small bowl. After 25 minutes, pour the mixture on top of the sweet potatoes and return to the oven for approximately 10 more minutes, or until the marshmallows are lightly browned. There are countless variations on the basic sweet potato soufflé recipe. Liven up or tone down your recipe using one of these variations. For many, the answer is clear: Only fresh sweet potatoes will fit the bill for the most flavorful soufflé. If, however, you wish to save time and effort, substitute canned sweet potatoes for fresh with minimal flavor loss. Be sure purchase unsweetened canned sweet potatoes if you decide to use them. Fresh sweet potatoes can be either baked or boiled before mashing. Baking the potatoes yields the most flavor and best texture, but boiling is often faster. The potatoes you see sold in your grocery store and labeled as yams are likely a variety of sweet potato that has been mislabeled. True yams have dark - almost black - skin and a sweet interior similar to that of a sweet potato. Yams have a higher natural sugar content than sweet potatoes; if you can find real yams, your resulting soufflé will be sweeter. If you are purchasing potatoes with a lighter colored flesh that are labeled as yams, the chances are that they are actually a sweet potato. Either will work just fine, depending on what is locally available. Mix together a streusel-like topping with 1/3 cup of butter, 1/3 cup of flour, one cup of brown sugar, and one cup of chopped pecans. Sprinkle chopped nuts, such as pecans or walnuts, over the top and bake. Sprinkle chopped peanut brittle on top before baking. While cinnamon is used in nearly every sweet potato soufflé, it isn't the only spice that works. Try out any of the following to give your soufflé a signature flavor. Once you've perfected your soufflé recipe, don't just confine it to holiday meals. 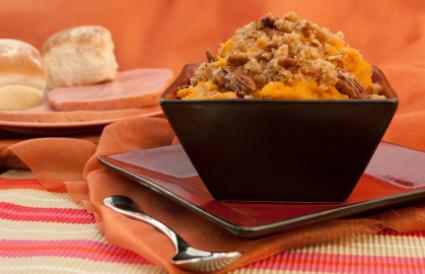 Make this simple side dish any time of year to add some sweetness to your day.